Ports have changed greatly over the years and so has dockwork. There is a lot of EU legislation and policies on ports and shipping which affects the sector and its workers. 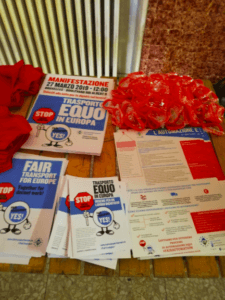 With EU elections just round the corner, ETF organised a meeting with the MEP Brando Benifei to set our priorities for the future of port work at the legendary headquarters of the Genoa labour pool. For the event, we gathered our three Italian affiliates (FIT CGL, FILT CISL and UILTrasporti), more than 100 dockworkers, politicians, researchers and academics, port authorities and terminal operators and other maritime stakeholders. The reinforcement of labour pools to cope with the growing peaks and lows while guaranteeing social protection to workers. Dockers have always shown that they can adapt to the evolutions in the sector and we are utterly determined to fight with them for Fair Transport and the future of dockwork. 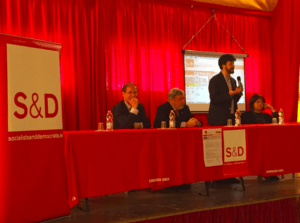 “The priority must be the protection of work also through the re-launch of ambitious social and training policies that are complemented by national and European investment policies and infrastructures” MEP Brando Benifei stated. “We need a new EU directive on corporate social responsibility and a European fund that amortises costs related to both technological and environmental transition”.